Bus from Kuantan to Shah Alam is increasingly popular for locals due to the metropolitan process in Shah Alam. Many working adults and students from Kuantan rely on the direct bus from Kuantan to Shah Alam. With no train and flight service between the two cities, taking bus becomes the only option for them to travel to Shah Alam from Kuantan. Transnasional, Konsortium Express and Jasa Pelangi Express are few brands serving bus from Kuantan to Shah Alam. Jasa Pelangi Express is the dominant player among them by providing 5 daily trips. Their combined trips have total 10 daily trips to Shah Alam from Kuantan. All three operators are operating the bus route with VIP coach. VIP coach comes with spacious seating and large leg room, such that passengers could have comfortable journey to destination. 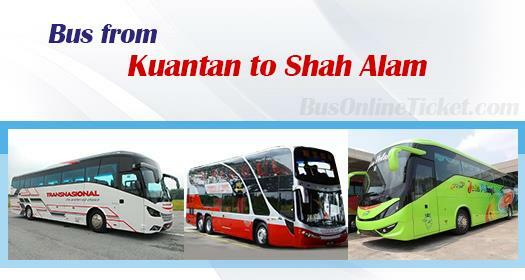 The duration for bus from Kuantan to Shah Alam takes about 3.5 hours, depending on traffic condition. The bus ticket price from Kuantan to Shah Alam is charged reasonably in the range of RM 28.10 - RM 28.50, depending on the choice of bus operator. One washroom break will be given during the journey because buses do not have toilet facility. The boarding point at Kuantan is located at Terminal Sentral Kuantan while the drop-off in Shah Alam is at Terminal Bus Shah Alam Seksyen 13. Kindly note that Shah Alam Bus Terminal is moving to a new terminal in near future. You can book your bus ticket online now from our official website BusOnlineTicket.com or via mobile app which can be downloaded for free in App Store or Google Play just a fingertip away. You also can earn BOT Miles to redeem your discount code through our loyalty program. Hurry up and grab your bus tickets now before sold out!